Hmmm … why do I think of this? I was just tagged by Ann Oro in the meme going around the education blog circles called “Seven Things”. See the video does make sense! Let them know they’ve been tagged by leaving a comment on their blogs and/or Twitter and/or Plurk. I have lived in 5 states in the U.S. and 1 foreign country, Canada, and even went to high school in Canada. I am the oldest of 5 children in my family, only 4 of whom are still living. I was a major teen idol “fan” way back when and spent way too much time & money following The Osmonds around the country. I’m the mother of two “fans” of my own these days which explains my knowledge of the video above – that and the fact that I teach elementary & middle school girls! Speaking of being a “fan”, one of the first groups I loved was The Cowsills and today I am their webmaster. If only I would have known what would be when I was 12 and in love with John Cowsill. I am a wanna be photographer (okay maybe you did know that one) and take a lot of pictures for my daughters’ dance studio and for my school’s yearbook. I love to scrapbook – okay these days this should be, I love to think about scrapbooking since I can’t remember the last time I actually did any scrapbooking. I do still have lots of supplies though and I even have a Scrapbooking Website … that I haven’t updated in ages. My two favorite drinks are Diet Coke and Snake Bite (the lager & cider variety if you please). Oh and a bonus one, I met my husband in a bar – okay really a PUB which is different than a bar. Yes you can meet people in a bar (uh, pub) and to tie it in to some of the other 7 things … I was at the bar to see Bob & Susan Cowsill (#4) and I was drinking a Snake Bite (#7)! Now it’s my turn to tag and I’m supposed to tag 7 others. The problem is most everyone I would normally tag has already been tagged so I’m only tagging 4 and they are: JoNelle Gardner, Amber Coggin, Kevin Jarrett and a non-edublogger, Tracy P! Tell me something I don’t know about you. It’s obvious that I talk a lot about student projects on my blog and that’s a good thing since that’s the purpose of my blog. You can tell that the election was a recent subject of posts … and actually of projects in the lab. It will be interesting to see if this changes over time. I’ll have to try this again every few months or so and see. And now I tag Maddy Shapiro, Michelle Russell and Heidi Pence. 1. 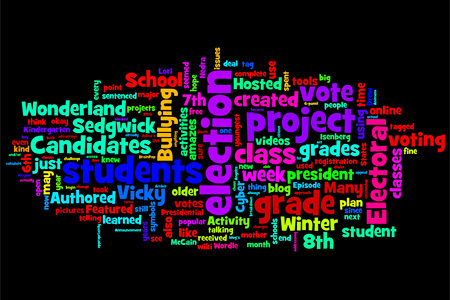 Create a Wordle from your blog’s RSS feed. 2. Blog it and describe your reaction. Any surprises? 4. Be sure to link back here and to where you were first tagged.